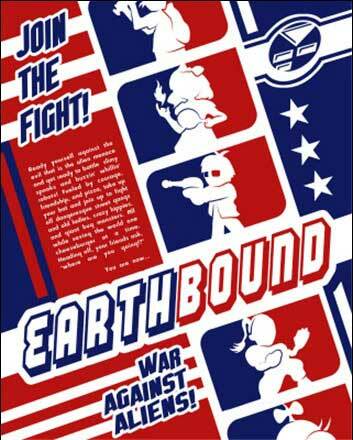 An advertisement for my beloved Earthbound, which I believe ran in Nintendo Power back when the game was released. I couldn't find a bigger version, so I unfortunately can't make the text readable, but I still really like this ad. Holy crap, that looks cool. I thought that they were going to do an EarthBound movie, for a second there. This isn't an advertisement, it's a fanmade poster. Starmen.net ran it awhile ago on their Cafepress store, but since they got a new store it's been discontinued.